So begans the original production company introduction to the 1996 film “Twister.” Myths are stories that tell us about the deepest things we believe to be true, as a culture and as a people — often without conscious intent on the part of the storyteller who is simply a member of the same culture and so assumes the same things to be true. They express our culture’s paradigms, which are its assumptions about the nature of reality. Because mythic stories and art exist within a set of cultural assumptions about the nature of reality, they reinforce the truth of those assumptions in our minds. They also instruct new generations about the things our culture holds to be True, and so enculturate youth within a specific people, time, and place. In that context, what do tornadoes’ “fearsome and mighty place in American mythology” tell us about the things Americans believe to be True? A scene from “Twister,” Warner Bros, Universal Pictures, and Amblin Entertainment, 1996. So is the film “Twister” merely a depiction of reality instead of mythic story? Click here to find out. Scene from Rogers & Hammerstein “Oklahoma,” The Samuel Goldwyn Company, 1955. 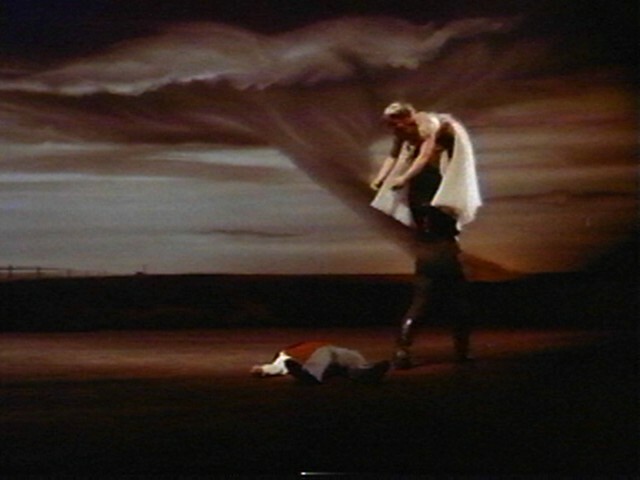 The musical “Oklahoma” has a dance dream sequence in which the characters of Laurey, Curly, and Jud interact with each other symbolically against a very plain backdrop on which a tornado eventually appears. This tornado is sinister and its appearance is associated with changes in music, lighting, and the action on the screen. What mythic truth of American culture does it tell us about? Click here to find out. A scene from “The Wizard of Oz,” MGM Studios, 1939. The tornado sets the whole story in motion in “The Wizard of Oz,” by picking up the farmhouse in which Dorothy hides and whisking it away to a land “somewhere over the rainbow.” The early sequences of the film in which the tornado threatens and then sweeps Dorothy away are in black and white, in contrast to the bright color of the Land of Oz and its yellow brick road. The tornado is the agent of alchemy that takes Dorothy to the exciting and beautiful place she’s been longing for — that turns out to be a land of danger as well as new friends, a place where things are not at all as they seem to be. She returns having learned that the things one wishes for most are inside a person all along. What mythic story about science does this movie tell? Click here to find out. What does this mean about the Mythic Story being told in these films in which tornadoes are important elements? 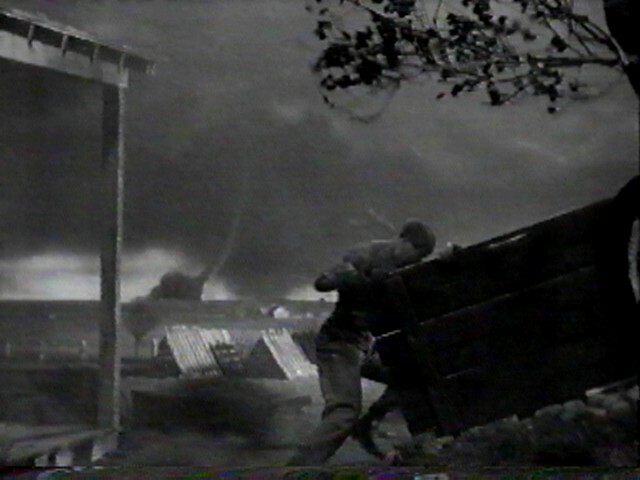 In all three films, the tornado symbolizes dangerous Nature, whether outside ourselves in a storm of lightning and high winds, or inside ourselves in storms of sexuality and aggression. In all three films, people turn to Science and Scientific Progress for protection. In “Twister” and “Oklahoma,” they find it; in “The Wizard of Oz,” they do not. The interesting thing to realize here is that the cultural myth being explored in all three films is the same one: Science Protects Humans from Dangerous Nature. “Twister” tells that Story straight out, simply assuming its truth as a given on both artists’ and audiences’ parts. “Oklahoma” expresses the Story more subtly, within the context of the larger Story about scientific and technological progress being good and right. “The Wizard of Oz” tells *the very same Mythic Story* but challenges its Truth. “Musical Vortices” by Shawn Richard Selders. “While I find tornadoes to be powerful, awe-inspiring, and hypnotically beautiful to view, I also see them as a symbol of how truly fragile our lives and good health are on this planet. I strongly believe that art can bring healing and joy into peoples lives. I hope that my work can achieve that result. 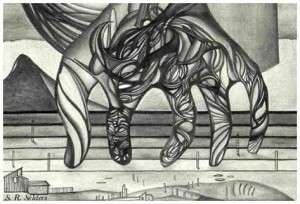 My tornado drawings are dedicated to all people and animals, throughout history, that have been killed or seriously injured by tornadoes.” Used with permission. “Severe Situations” by by Shawn Richard Selders. 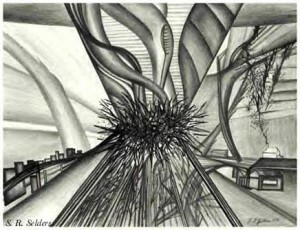 See quote on his other drawing, “Musical Vortices”. Used with permission. 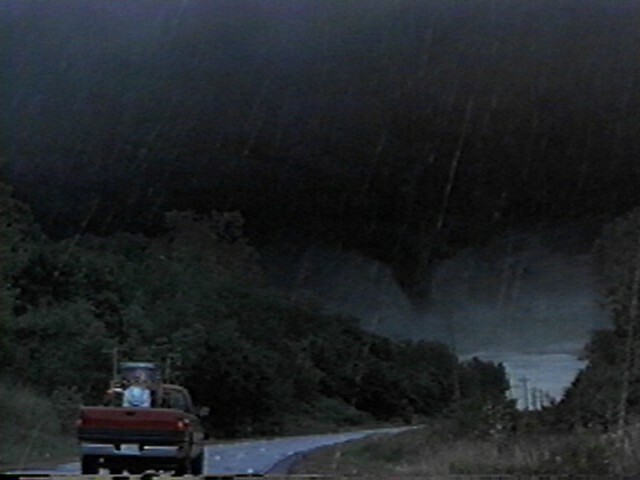 Notice that this particular mythic story exists within yet another and much larger one, one that is particularly subtle because it is so deeply entrenched in Western culture: “Nature is Dangerous.” In all three films, even the one that challenges the Truth of “Science Protects Humans from Dangerous Nature,” the tornado is not at all an ambiguous symbol; it is evil. Also notice here that the larger the mythic story, the more true it feels. Many people, once they become aware of the presence of the mythic story “Science Protects Humans from Dangerous Nature” in a film like this will pull up short and think about whether or not they agree with that notion, and turn the pros and cons of it over in their minds — focusing on Science. The paradigm that “Nature is Dangerous” is more pervasive and therefore harder to spot as a “given” in the context of these films. In this case, the symbol chosen makes it even more difficult to spot the paradigm as such and challenge it; tornadoes are dangerous and destructive, so if they embody Nature in the story, then Nature is also dangerous and destructive. It’s a matter of identity. Yet if we turn to spiritual ways of knowing about tornadoes, it’s clear that tornadoes are at least potentially highly ambiguous things that deal death off one side but life itself off the other. The paradigm “Nature is Dangerous” influences the ways we see tornadoes themselves, which in turn confers upon them the symbolic meaning they have in our culture. Understanding the symbolic use of tornadoes in films that express our culture’s myths may lead you to greater awareness of your place in a world that has natural phenomena like tornadoes. More importantly, it may help you really see the kinds of things our culture holds to be true — about nature, about science, and about ourselves. Only then can you decide whether or not you think those truths are ones that should still be passed along as part of who we are and what we believe. Continue to Integrated Ways of Knowing and Learning About Tornadoes. Return to Mythic Ways of Knowing and Learning. Credits are provided for all videoclips and photographs used on the site, which are posted under the fair use clause of copyright law permitting limited use of small amounts of copyrighted material for educational purposes only.